A Case Study: Backyard Chicken Farmers — to flock or not to flock? In the face of a progressive national movement toward being able to directly source our foodstuffs, we find ourselves standing in our backyards, contemplating a design mined from one of many how-to websites on building chicken coops. This isn’t the beginning of our engagement with identifying our food sources; it is the first step of commitment to being a chicken farmer. The practical impetus behind backyard chicken farming is obvious: free eggs, free chicken dinners, plus knowing where both came from—our backyard. We know what the chickens eat, drink, and just how ‘free’ their life has been. The ‘free’ element is attached to the second component of backyard chicken farming: the romanticized view of what makes these foodstuffs ‘free’. Our study is designed to explore the practicality of backyard chicken farming and some of the less-than-romantic issues associated with it, especially the aromatic one that affects those who raise the chickens — and all their neighbors in smelling distance. Nothing teaches the pros and cons of any effort like personal, hands-on experience, so our study follows the evolving chicken-raising efforts of a couple living in a residential area of a large Midwestern metropolis. From coop to run to free-ranging, all chickens were raised in a backyard and neither of the participating chicken-raisers had previous farming, livestock, or chicken-raising experience. The study determined that the decision to raise chickens was founded on subjective considerations. Apparently, one subject felt chicken-raising was an appropriate next step, and the other subject felt obliged to make it happen. Additionally, it was determined that pre-emptive research prior to actually acquiring chickens revolved around chicken-raising websites, chicken coop-building websites, and hours of YouTube viewings about chicken-raising (some involved silly chicken videos, but were also considered as educational). It appears that few specialized tools or devices were necessary to initiate the actual raising of chickens. The study will delve into the various issues encountered during the 3-year analysis of this particular backyard chicken raising operation. Comparison research has shown that this backyard, with the chicken-raisers and their chickens, as well as the positives and negatives encountered, are very likely representative of the average chicken-raising experience. Preparing for baby chicks is vastly less complicated than erecting living quarters for partly or full grown chickens. Chicks can begin life in a plastic tub, a small cage, or a cardboard box — really any container that allows them room to hop about and to have food and water handy. There also needs to be a simple heat source, such as a light bulb, to maintain the temperature in the chick environment. The study operation has raised two clutches of chickens, separated by approximately 3 years. The first clutch of six chicks arrived in April and spent 3 weeks in a box until the outside temperature in the coop could easily be held at 70 degrees. A single 75watt light bulb generated sufficient heat. Various guides were found showing the general range of necessary temperatures, from 95F to 70F, in weekly cooling increments. The study determined two eventualities to the baby chick evolvement: 1) the chicks will be large enough to fly out of the box at 3 weeks; 2) the area the chicks occupy will reek within one week. The flying out of the box can be controlled with a piece of aptly-named chicken wire secured over the box top. The funky stink might be lessened by changing the bedding material in the chick box, but the ammonia smell will linger on. This is the point where NoOdor.com’s Smelleze® Natural Chicken Coop Deodorizing Granules became part of the chicken raising regimen. A half-full shaker-container of granules was gifted to the chicken raisers from a relative who had used it to eliminate ammonia odors from her dogs urinating in the same spots in her yard. Since the granules are all-natural and non-toxic, the organic-conscious backyard chicken raisers knew they would be safe to use with their baby chicks. The Smelleze™ Granules immediately absorbed the ammonia stench. Additionally, it was noticed that the baby chicks ate some of the granules. Upon investigation and inquiry, it was confirmed that the granules, when ingested, would internally ‘deodorize’ the baby chick waste. When temperatures can be maintained outdoors naturally or with a light/heat source at around 70F, the chicks can be set loose in their coop. If they are to share a space with established hens, as was the case with the second clutch raised in the study, it is best to create a fenced area within the coop with fresh water and a feeder for the chicks. This set-up allows the hens to become accustomed to the new chicks, and will reduce the potential for hen attacks later. Chicken raising demands a specific space for the chickens to inhabit. This space usually consists of a coop with roosting rungs and nesting boxes, and, if space allows, a “run”. Suggested spacing varies from 2-3 feet for each chicken, depending upon the breed and size. The coop may be a bit tighter in space, if there is access to a “run” or the chickens are free to roam when outside the coop. Coops can be pre-fabbed or raw-construction. In this study, the coop was built onto the side of an existing storage structure in a back corner of the yard. Some lumber, wire fencing, and roofing shingles were all the materials required. An existing electrical outlet on the storage structure was used for the single bulb heat source, which hung from the ceiling of the coop. The final coop consisted of wire-enclosed area with a hanging water dispenser, a self-dispensing feeder, two roosting rungs that were simply tree branches set horizontally 2 and 3 feet from the ground, a ramp up to three nesting boxes, and a door so the chicken guardians can access the area. The ‘floor’ in the coop is dirt, the bottoms of the nesting boxes are covered with clean shavings that are regularly changed. Since the initial clutch of chickens was housed in the coop without a run (which would happen later), the decision was made to continue using the Smelleze® Natural Chicken Coop Deodorizing Granules. The concern over the ammonia smell was driven by local regulations, which allowed chickens to be raised in residential areas, but also stated that any odor must be strictly controlled. It was determined that the coop could be ‘treated’ with a single light sprinkling of Smelleze® Granules each week and ammonia odors were non-existent. The second clutch of six chicks came to seasoned backyard chicken raisers and started life in a 1 x 1 x 3-foot wood and chicken wire cage that opened from the top. A 2-foot long feeder spanned the center, while a peck-n-drip water dispenser hung at one end. An old single-bulb desk lamp served as the heater. The chicks were hopping atop the feeder (4 inches high) by day four. After 2 weeks inside in controlled temperatures, the chicks were moved into a fenced off area in the coop, where they remained until they were 8-10 weeks old and large enough to escape the older hens if one tried to peck at them. Experience showed that regular use of the Smelleze® Natural Chicken Coop Deodorizing Granules kept the coop, plus the added 12 x 12-foot fenced in run, completely free of odor. The regular use had also eliminated the musty odors and chemical smells from the adjacent storage building, although this was accomplished simply through any granules that missed the run or coop and fell near or under that structure. The new clutch of young chickens, on their first release to the run, discovered they could fly. Wing clipping and higher fencing of the run proved unable to contain the new clutch. Observation determined that the existing, older hens were bullying the youngsters, who escaped by taking flight. Nearing the age to begin laying eggs, the new chickens going rogue posed a serious problem. Going free-range in the backyard meant being vulnerable to predators and neighborhood dogs, who liked fresh chicken for dinner; however, soon the older hens were also attempting to fly out of the run. It was determined that they hadn’t realized they could fly before seeing flight. This prompted several discussions about chicken mentality, with more than one opposing view about ‘stupid’ versus ‘smart’. Ultimately, the chicken raisers in this study made the decision to go full free-range. Several weeks of retrieving chickens from neighboring yards followed, and the chickens eventually learned the boundaries. Two final issues were revealed in the free-range paradigm: 1) eggs might be laid–anywhere–in the yard (or the neighbors yard); 2) chickens deposit waste approximately every hour (or less) –anywhere–in the yard (or the neighbors yard). The first issue is an on-going hide-and-seek process. Eggs may be laid in one location, but once they are removed/harvested, the hens will seek out a new spot. The latest count is 14 different locations, with some being re-used several weeks following the initial laying. Caches of ‘hidden’ nests have resulted in egg ‘finds’ of 12, 17, and 21 eggs. The current backyard chicken population is 9 chickens, which lay 5-8 eggs daily. The older chickens may only lay 3 eggs a week. The second issue is also on-going, as the chickens now defecate freely throughout the yard. Going barefoot is forbidden and deterrents are in place to keep the chickens off decks and outdoor furniture. Shoes are always left at the door when coming inside. Yet, with all these care-taking efforts, one thing stands pat: there is no smell. The day the chickens all began to free-range, the study observed the chicken raisers pouring Smelleze® Natural Chicken Coop Deodorizing Granules into a hand-cranked seed spreader, and then broadcasting the Granules throughout the yard. A regular application was repeated weekly, concentrating on areas where the chickens loitered, like in their ‘dust bath’ spots under the deck. Chickens? Really? . . .Where?? After the full study period of 3 years and 2 months, with nearly 1 ½ years involving 9 chickens free-ranging in a backyard, and treating that backyard with Smelleze® Natural Chicken Coop Deodorizing Granules roughing every 2-3 weeks, it was determined that any waste odors were completely controlled. No neighbor complaints were received at any time during the study period. Additionally, visitors, who were unaware that chickens were being raised on the property, invariably showed surprise due to the lack of ‘barnyard’ odors. In conclusion, the study was able to make a firm determination that Smelleze® Natural Chicken Coop Deodorizing Granules eliminated the odors created by chicken waste in every living situation, from the confined quarters of baby chicks kept in the house to the chicken coop and run to the entire backyard. The chickens safely ingested the granules without harm and without affecting the eggs laid. The applied cost of using the granules to effectively control the waste odor was negligible when compared to the heightened quality of environment that was created by their use. 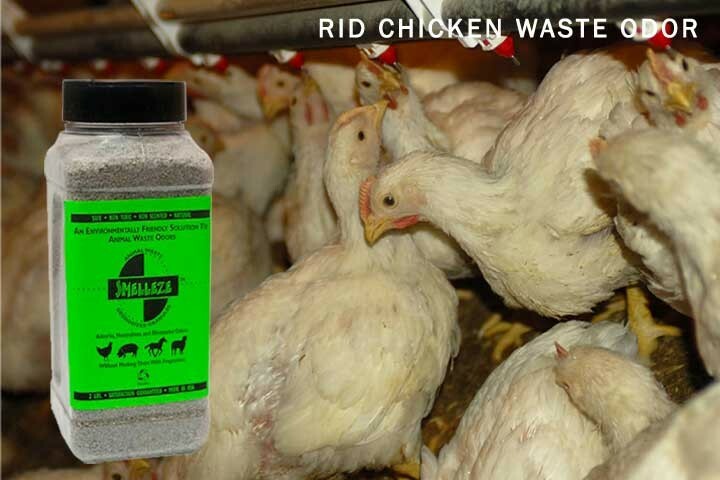 The study believes the Smelleze® Natural Chicken Coop Deodorizing Granules afforded a safer, cleaner, healthier environment for the chickens, the people raising the chickens, and the pets co-habitating with the chickens.